Are you excited to start getting fit? Exercising daily can make you feel positive by knowing that you are getting in good health each day. ProForm PFTL 99715 Power995i Exercise Treadmill may deliver that healthy body to you. To ensure that this walking or running machine will truly deliver the well-built body you want to achieve, read on this review and learn more about this treadmill model. This treadmill may be for you if you weigh more than 300 pounds and would like a sturdy and large exercise machine. Also, if you are particular about inclines and the size of the belt; this model may be a good choice. Of course, as in any other treadmill models, there could be some negative factors; but the over-all assessment on this machine is generally fair. If you are not bothered doing your own assembly, you may do it on your own. Since this is created to save on space, this may help if you do not have enough space at your home. The Watts LED Display of this treadmill provides you instant display of your workout level such as Tempo, Endurance or Peak zone. The 3.0 CHP motor can support your prolonged and powerful workout. Another beneficial factor is that the motor is covered with a lifetime warranty. Cushioning seems to be not a problem with this treadmill as it is cushioned with ProShox cushioning. Having a comfortable workout is achievable with the built-in fan by CoolAire and internal speakers. You may stay cool while listening to your favorite music when working out. With this treadmill, you can create your training with innumerable personal trainer certified exercises and download a map route from Google for a picturesque walk or run and the treadmill will automatically hold fast to the terrain of the location in your map which you selected. Although many like this treadmill, there are few who find it big and long making it difficult to be stationed at their homes or rooms. Still, few other users find it heavy which makes it not appropriate to be carried upstairs or downstairs anytime you want to. Apparently, the instructions for assembling it are not that detailed which some found not easy to follow and it may take longer time to assemble. When using the internal speakers and a change in incline or speed will occur, there will be a beep sound which is somewhat annoying. ProForm PFTL 99715 Power995i Exercise Treadmill, Graphite, Large is truly very comfortable to walk or run on. It is very quiet, no whistle and no squeaking. At least, you will not be annoyed with any unwanted sound, just the sound of the treadmill itself. The speed and the incline work so well. Even if you have prolonged use of it, it will not breakdown and the performance remains the same. You can easily change the incline and able to achieve a challenging workout. Connection to WiFi is easy when instructions are followed religiously. The built-in fan also works very well to obtain a comfortable and cool workout all the time. ProForm PFTL 99715 Power995i Exercise Treadmill, Graphite, Large may be good for you is you prefer a treadmill that is large enough to accommodate your walking or running. It is also best for you if you want a real sturdy and quiet exercise machine. Also, if you prefer a treadmill that can provide you with good exercise programs created by workout experts. If you still have time, you may try it out first before deciding on buying. This will help you know if it will really suit you. Display: Watts LED display with LED lights which display if you are in the Peak, Tempo or Endurance level. Buying is always recommended directly from the Manufacturer or authorized distributors. 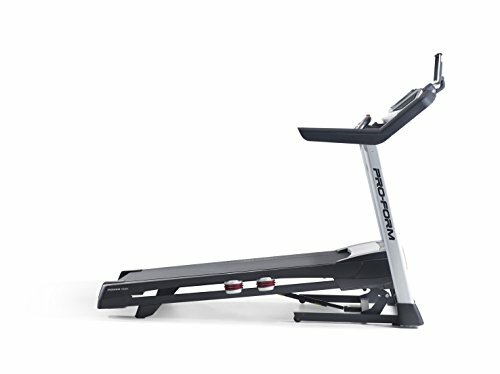 Amazon.com is another good place to buy treadmills and other exercise machines.